Need some holiday gift and toy suggestions for a child with cerebral palsy, autism, Down syndrome or sensory issues? Here you go! Because you've already got enough stuff to ponder. This year's roundup features recommendations from teachers, therapists, parents, and my favorite expert, my boy Max. It includes toys and crafts that help with fine-motor skills, gross-motor skills, cognition, social skills and having a good old time. As usual, I didn't include age ranges because what motivates your child motivates your child (although if yours has a tendency to swallow objects, mind the "choking hazard" warnings on labels). Stick these little suckers together to create any variety of shapes—an octopus, jewelry, a cat. Or whomp them onto any solid, non-porous surface including windows, bathtubs and tabletops. Kids may need help putting them together, but will enjoy the squelch sound they make when they stick and suction-y sound they emit when pulled apart. 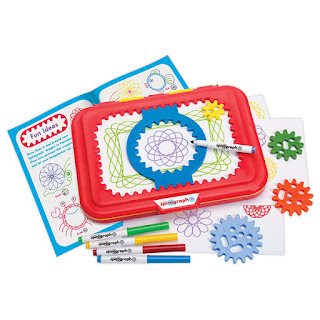 The portable case features a built-in design desk that holds paper, with a gear ring that keeps gears in place as kids create squiggly masterpieces. Comes with five washable markers, four gears, a 24-pages drawing pad and a design guide book. 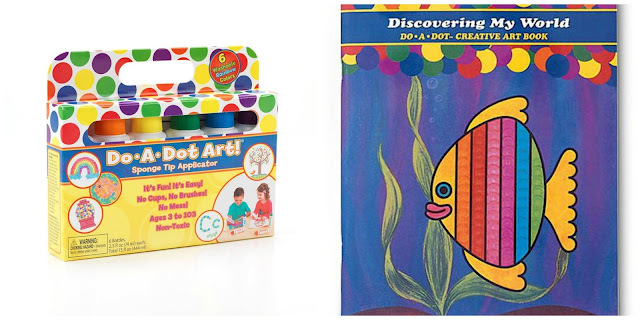 Kids fill in these coloring books using the kind of paint markers found in bingo halls. They're great because they're chunky and easy to grasp, and kids don't have to press hard at all. 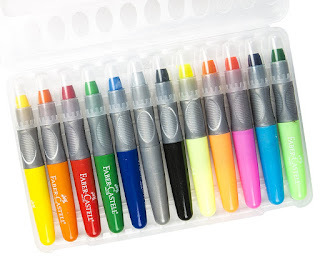 The markers (found here) are water-based and washable. Books include Discovering My World (shown), Mighty Trucks, Picture Me a Princess, Farm Animals, Discovering Mighty Dinosaurs, Zoo Animals and more. 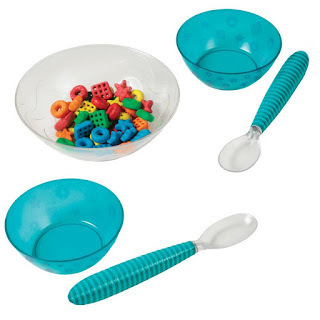 Here's fun encouragement for helping a child grasp a spoon (or grasp, period): After turning on the spoon, kids watch for the color change then attempt to pick up the cereal pieces that match the color. This helps kid practice hand-eye coordination and color recognition, too. Also: sugar-free! He he. 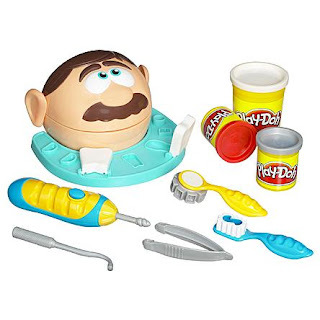 Kids get to play dentist: they can make braces with Play-Doh, brush teeth, and give checkups with the electric drill and other tools. May help reduce dentist-phobia, too. 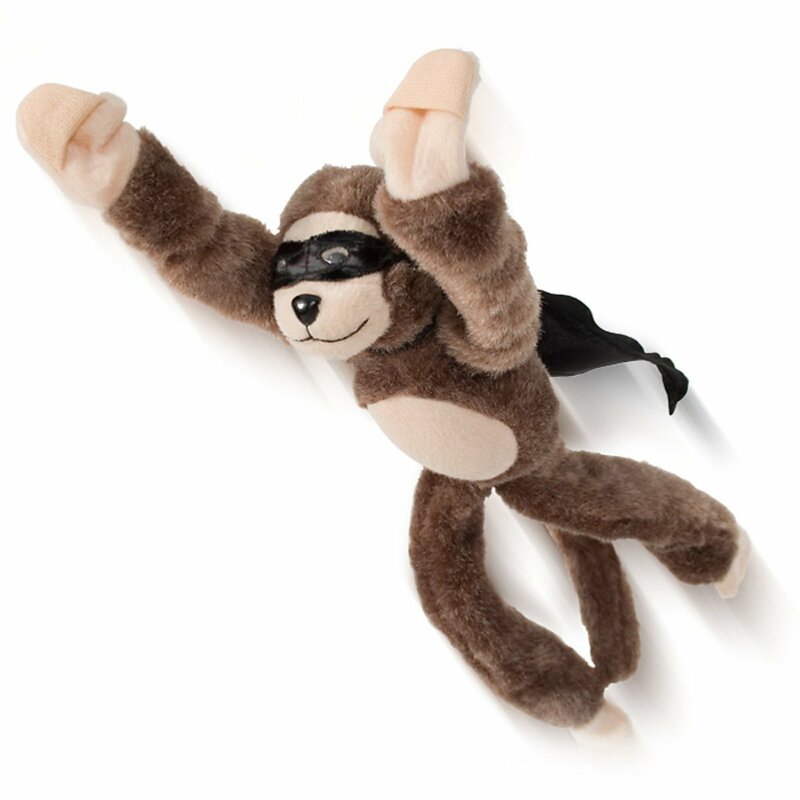 The monkey's hands each have a little pocket; kids put their fingers in, pull back and let 'em fly. Comes complete with screaming monkey sound (so not for kids who don't like noises). Can also be used effectively to startle an oversleeping partner out of bed. This lightweight (12 oz. 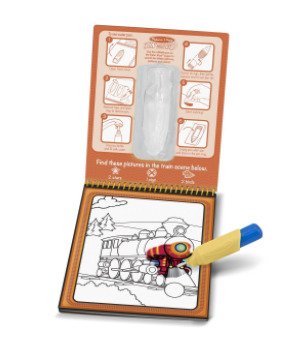 ), battery-operated drawing pad comes with four chunky stylus tools. It's really encouraged Max to draw, although as you can see in the video, when I try to get him to practice handwriting he gives me shortcuts. This two-in-one toy encourages kids to pound balls, tap the xylophone and get out latent aggression about not being able to eat ice-cream for dinner. 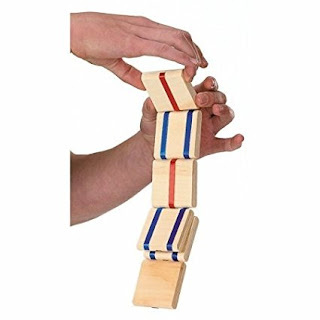 It's sturdy and well made, as Hape's toys tend to be. There's also a super-cute limited edition one in holiday colors, here. 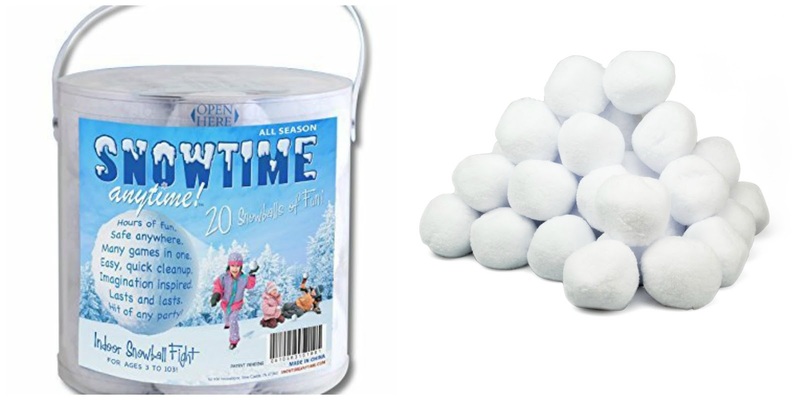 Grasping snowballs can be tricky for kids with fine-motor-skill challenges, but grasping these fake ones is way easier. They're slightly smaller than a tennis ball, and made of a knit material with contents similar to the stuff that's in stress balls. They don't hurt upon impact and won't destroy your home. Best of all, you don't have to bundle anyone up. 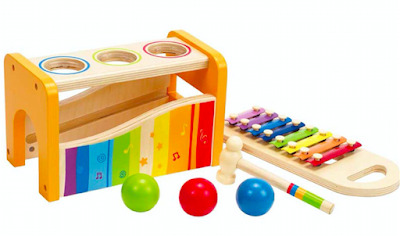 This is just the sort of simple toy to encourage open-ended play. 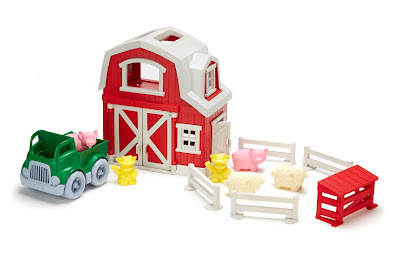 It includes a barn with doors that open and close, a pick-up truck, a farmer (who happens to be a cow), two sheep, two pigs, fences, a pick-up truck and a hog shed. Pieces fit inside the barn for storage. I've long liked Green Toys because they're made from 100% recycled plastic, sans BPA, phthalates, PVC...or batteries. 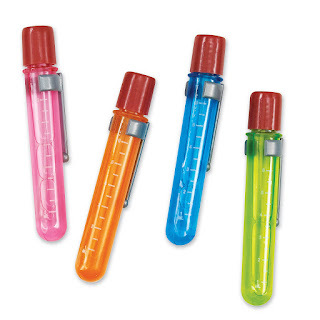 Kids use the water pen to "color" in the glossy laminated pages and make colors appear. Once dry, they can be used again and again. Take a pad or two when you travel. Shown, Vehicles. Also available in Safari, Under the Sea, Animals, Pet Mazes, Makeup and Manicures, Pet Mazes, Alphabet Activity Book, Colors and Shapes and Bible Stories. These simple sticks snap together, and can be used for open-ended play. 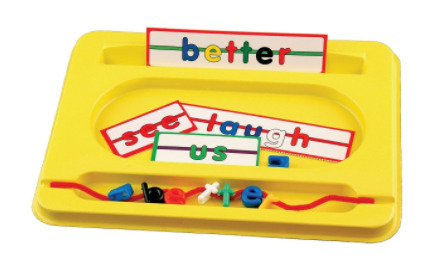 Also great for encouraging color matching and hand-eye coordination. Be warned, your child might ask you to build a fire truck or [insert current obsession]. Children push one of three buttons, slide them from slot to slot and...pop! The buttons snap into place. Kids can match buttons with their color slots, or not. Encourages cause-effect learning, color learning and finger usage. (Watch the video here). 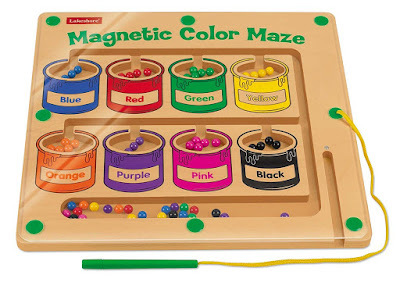 Children run the magnetic wand over plexiglass to to move balls around the maze and deposit them in the colored paint cans. This helps teach color and sorting skills, and is a really engaging way to get kids to move their fingers. It's not cheap, but it's super-durable and fun. You might find yourself playing with it after the kids are asleep. Stocking stuffer alert: These are chunky and easily graspable, and glide on like lipstick on paper. 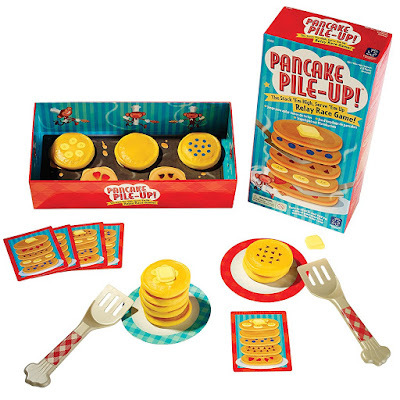 The short-order cook: Your child, who has to stack up 10 different-flavored pancakes, along with two pats of butter. Includes two plates and two spatulas. Your child can follow order cards, or do his own thing. 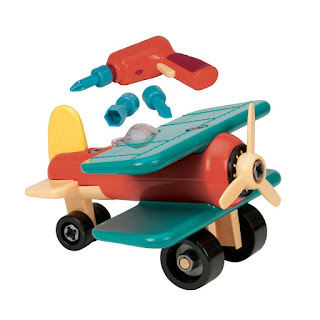 Mini mechanics can assemble and disassemble the 21 airplane parts using a battery-operated power tool and three bits, with help from you or your OT. There's also a Take-A-Part Roadster, Crane and 4 x 4. 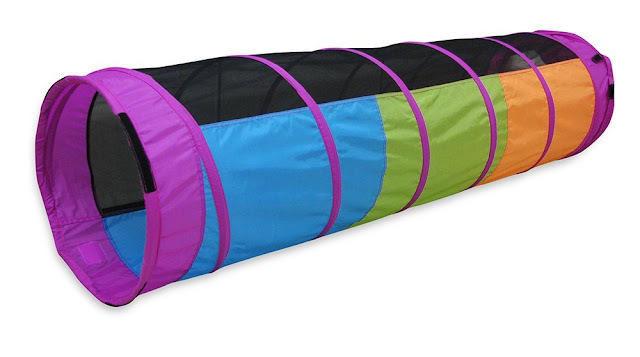 As children wiggle or crawl through this brightly-colored six-foot long tunnel, they work their muscles. It's very sturdily built, with padding around the steel frame, so it's comfortable on knees. The mesh on top makes it less intimidating for kids who might be fearful of enclosed spaces. 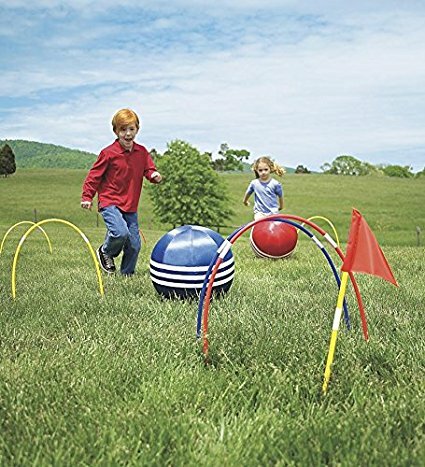 Another popular choice, at $17.84: Melissa & Doug's Sunny Patch Happy Giddy Tunnel. 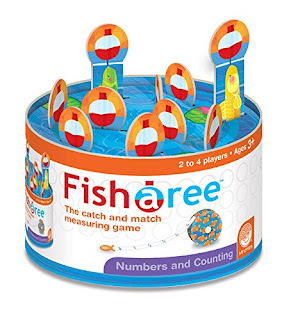 A great toy for arm usage and hand-eye coordination. 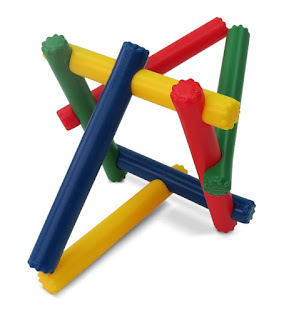 Max has played with this during OT sessions. 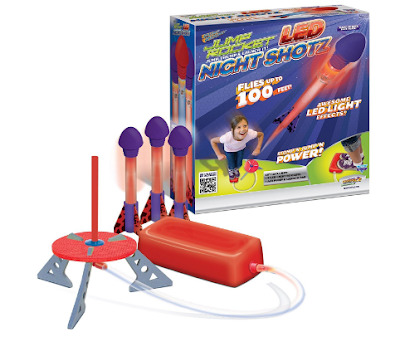 Max's OT has used a version of this to encourage him to load rockets onto the launching pad, then stomp on them with one foot to encourage balance. Light-up ones = extra fun. 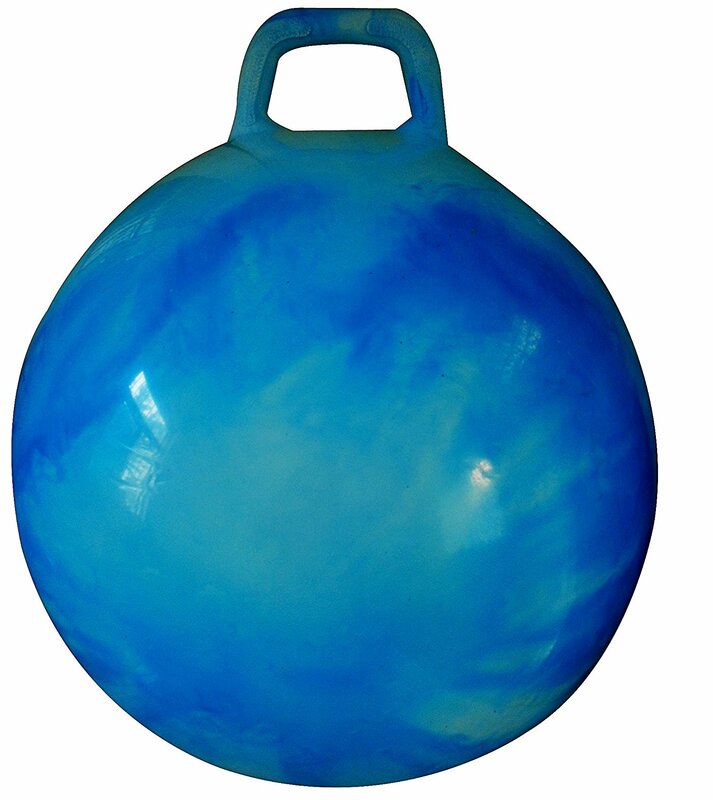 Therapists like to use gigantic round balls for stretching, balance and building core strength. One that has a handle enables kids to work on grasping as well. For indoor and outdoor use; comes with a pump for inflation. This one has a 20-inch diameter for kids ages 7 to 9, and is also available in 18-inch for kids ages 3 to 6; 22-inch for ages 10 to 12; and 28-inch for ages 13-plus. As kids move or dance, they trigger bright, colorful lights and fun sounds, songs, music and phrases. 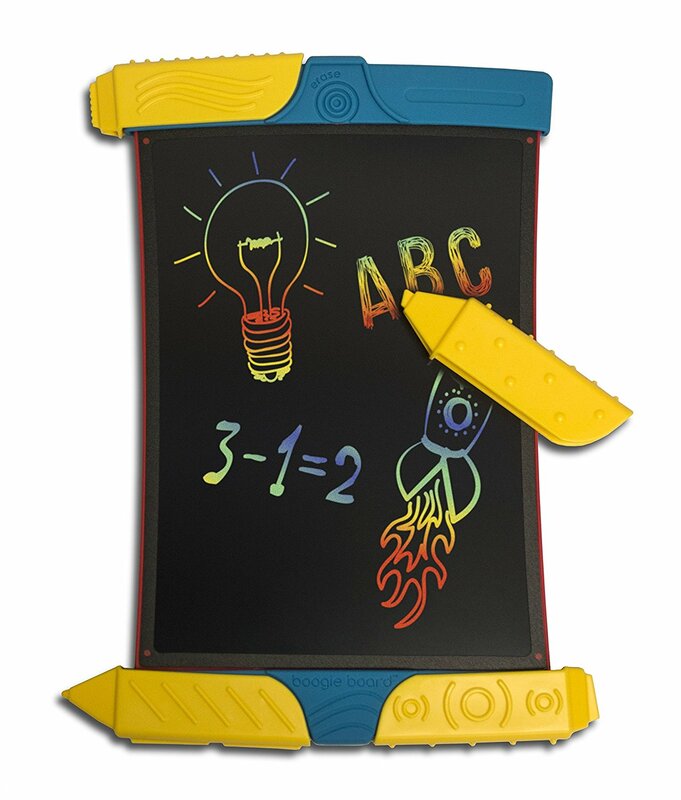 New this year, Bright Beats teaches ABCs, numbers, colors and shapes. 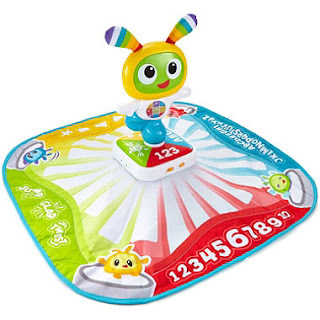 There are two ways to use it: In "Move & Play" mode, kids can bat at BeatBo (that dude in the middle) or press a button on the base to activate learning content and light shows. In "Dance & Learn" mode, phrases inform a child to move to different color sections; they're rewarded with songs, phrases and lights. 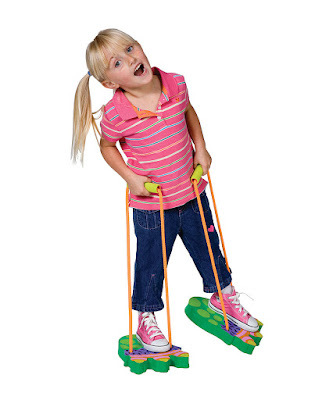 For walking kids who need to work on coordination and balance, these monstrous little thingies can help. Heavy-duty rope straps and padded handles make them comfortable to use; the feet relatively flat, so it's easy to step on and off. Or you can try doing what my dad and I did when I was little: Rest your child's feet on yours, with him or her facing toward you, then walk around. Bigger is better! Kids kick giant 14-inch cloth-covered balls through seven wickets. You'l probably want to use this one outside. Is it just me or do these children look like they're in The Sound of Music? 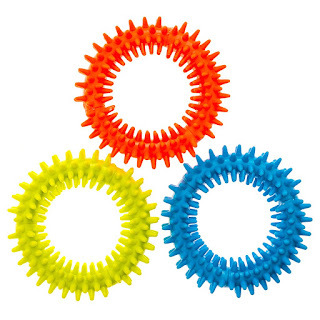 These plastic fidget toys, four inches in diameter, are free of BPA, phthalates and latex. They can be squeezed, locked together, tapped, twirled or manipulated in any number of ways. Also: chewed. 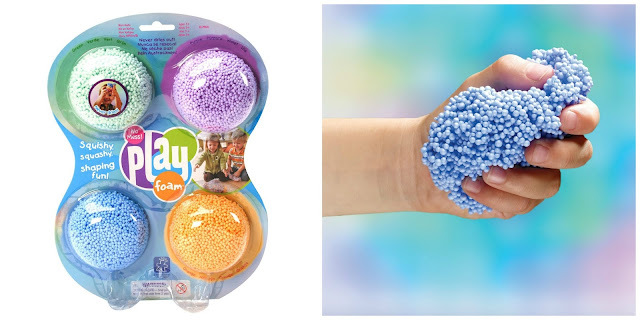 This no-stick, squishy stuff made out of little styrofoam balls offers tactile temptation to kids with sensory challenges. No worries, it won't stick to to carpet, clothing or car seats, and it doesn't dry up.Also available in a sparkly version. 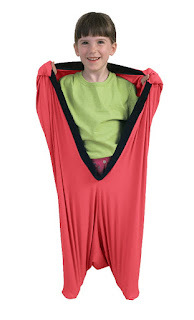 Parents of kids with sensory processing disorder swear by these sacks, made from Lycra and Spandex, for giving kids proprioceptive input—kids can stretch against the material or kick, kick, kick. It helps them feel calm and cocooned. Kids often enjoy watching TV and reading in them; some like to sleep in them. Not recommended: taking a bath in them. This is size X-Small (2 to 3 years); also available in Small (3 to 5 years); Medium (6 to 9 years); and Large (10 to 12 years). 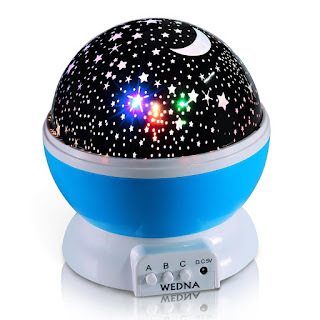 This rotating night light projects stars onto your child's ceiling, in a variety of colors—including flashing ones, if desired. 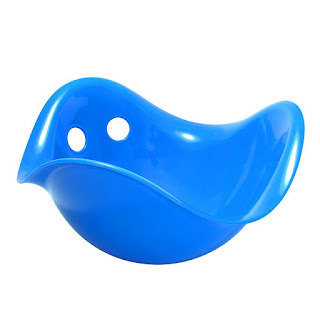 It also comes with a frosted cover that you can place on top of the ball so it's more of a nightlight. USB-powered or four AAA batteries. Also available in pink, here. 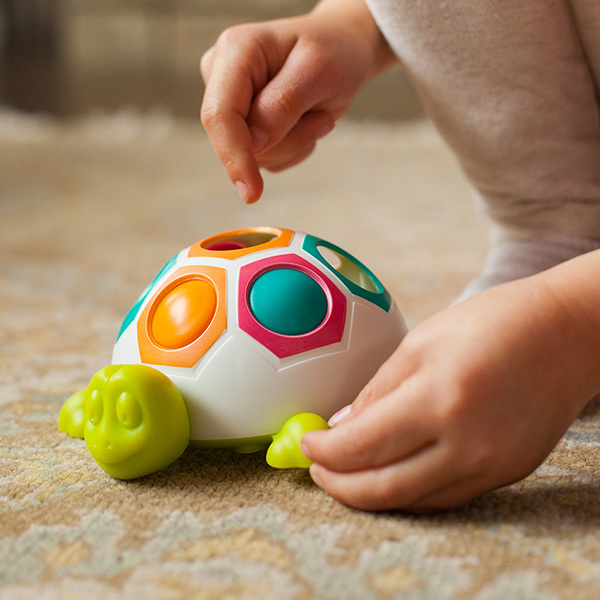 This award-winning plastic toy, designed in Switzerland, is soothing for kids with sensory processing disorder and autism; it also helps with motor planning and balance. Kids can sit in it, rock in it, stand on it, spin in it, stack it, fill it, slide it, or (of course) wear it as a hat. Super-durable, it can be used in water or snow, too. OK, this is an investment, but it could prove a worthy one. Parents rave about the vestibular input the disc gives kids with sensory issues, autism and ADHD. The slope can be adjusted with the built-in level; supports up to 150 pounds. 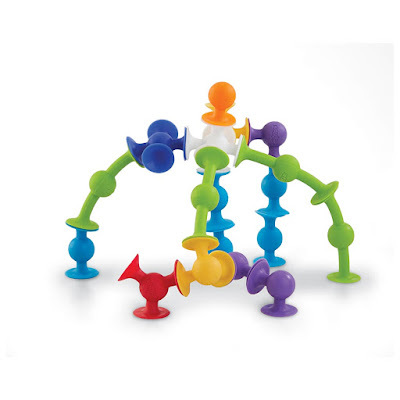 (Note: There is a "Dizzy Disc Preschool" that's available for $109, and the dimensions look to be the same.) 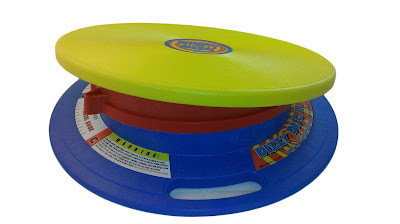 Lower-cost alternatives: The Playzone-Fit Twist 'N Spin Ride-On ($14.99) and the Sit 'N Spin ($19.50), like you had as a kid. 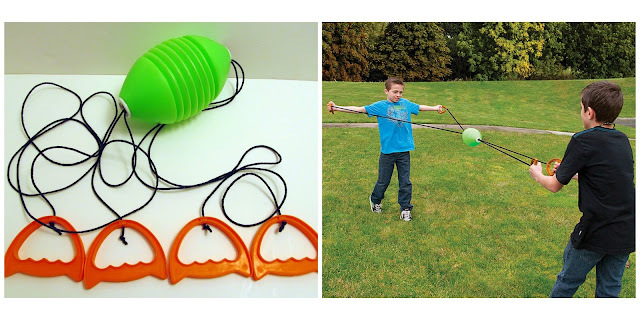 PTs use this for practicing gross-motor skills, balance, coordination and proprioceptive sensation—so it's handy for kids with sensory processing challenges. Best used barefoot. These babies stick around for way longer than your average bubble; you just have to wait a couple of seconds for them to to be touchable. Encourages breathing practice, too. 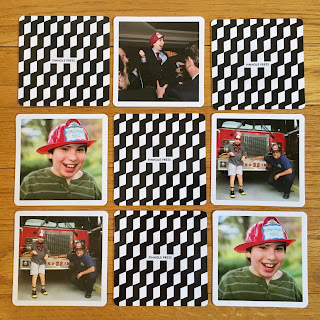 Personalize this game with 12 photos; you get 24 thick cards, glossy or matte. Your child has to pick up the cards and match the photos. 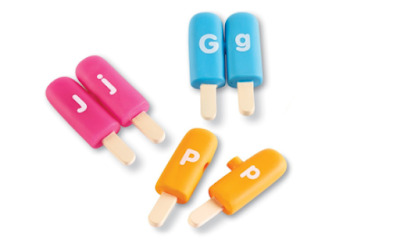 Kids match up the uppercase and lowercase letters, then snap them together. Set includes 26 double-sided pops. This hot new toy features nine segments—easy to connect—that kids can arrange and rearrange to tell the toy how to move forward, right, left, wiggle or dance. It comes with a motorized head with lights, sounds, and blinking eyes. 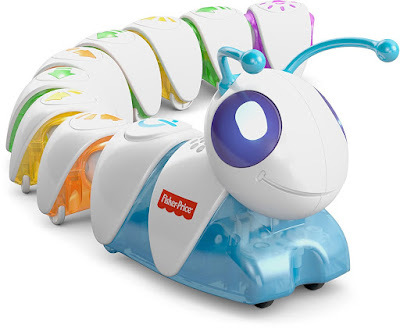 Code-A-Pillar teaches kids problem-solving and coding. It works best on flat surfaces, like wooden flooring or tile. Sadly, you cannot program it to clean up after your child. 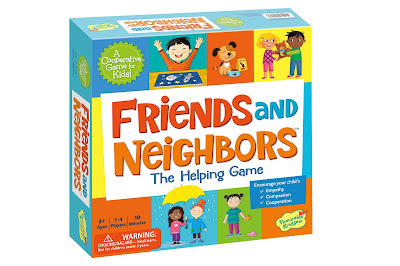 In this award-winning game, kids reach into a bag, pull out a token with a picture of an object and see if it can help a friend or neighbor on the game board—a girl who's sad because she's out in the rain, or a boy who's afraid of the dark. Parents can encourage children to recognize feelings in others, and ways to respond. Each of the lines has a fish on the end that's a different length. Players draw a number card, then try to catch two fish with lengths that add up to the target number, using the ruler to measure. This can also be used as a simple memory matching game. This deck of 150 cards has simple questions and engaging photos that encourage conversation, communication and much mirth. When I asked Max "What makes you laugh?" he responded, "Farts!" and proceeded to crack up for several minutes. Variations include Funny Sayings, Junior Edition, Conversation Starters, World Geography and Culture Facts, American Heroes and Legends, Sport Idioms and Conversation Starters: Middle School. Just place the sorting circles in the tins, and then kids match either the color or number of muffins by plopping them in with the tweezers. Kids learn color recognition, matching, sorting, counting, early math skills—and grasping. Includes 1 muffin pan, 2 dice, Squeezy Tweezers, 12 double-sided sorting circle inserts, 60 mini muffin counters and an Activity Guide. Kids string up words using chunky letter beads with big holes and spelling cards. Includes 218 word cards, 4 trays, 280 letter beads and 100 chenille stems. A durable board book to help encourage facial recognition, names and speech. 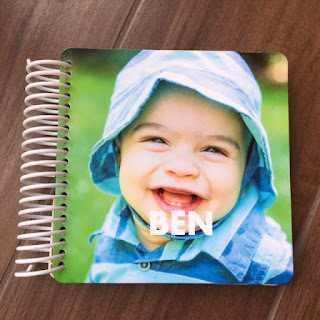 You can upload anywhere from 11 to 21 photos in 40 pages; 5.25 x 5.25" size. Once your child is through with it, you'll have a nice keepsake. 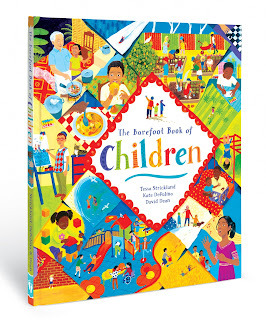 This beautifully illustrated book celebrates diversity and people's unique qualities while also helping children understand community and the many ways we are all alike. It provides an excellent way to encourage conversation about everything from why people dress and speak in different ways, and why some use wheelchairs and some don't. 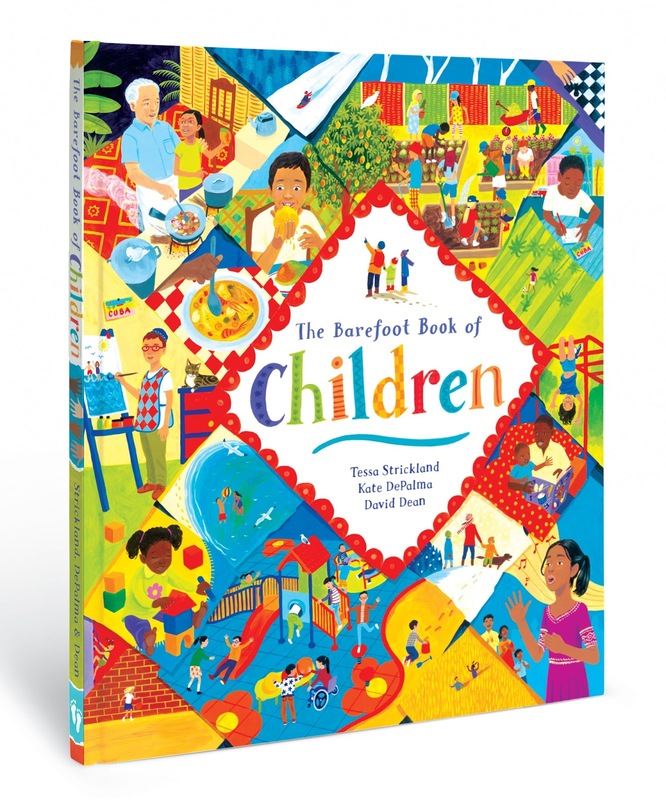 For more book suggestions, check out 25 best funny books for kids. Always love your gift guide! Thanks for sharing! when it comes to knowing kids with special needs, i think you are the first person on my mind !!!! The play foam is satisfying and great. Get it in your child's (or your) favorite color. I actually just got some for Sabrina, who gets stressed before tests. I had a zip ball as a kid. What a fabulous list - off to ponder and share now! 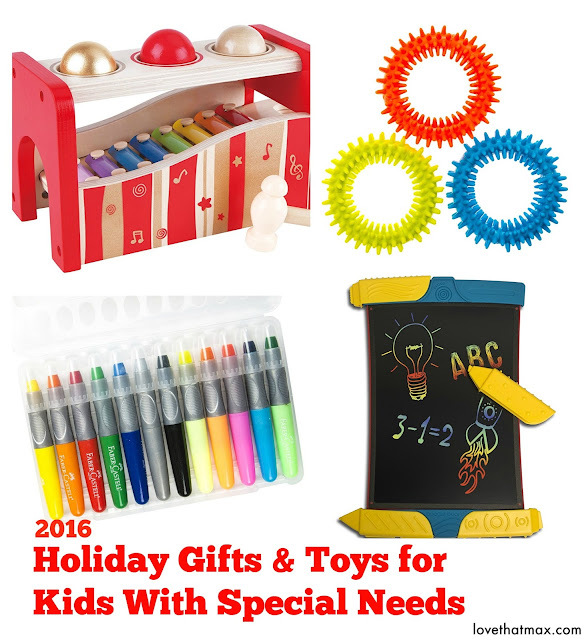 As a grandma with a special needs grandson, not even a year old this gives me a great list for Christmas. I appreciate the work that must have gone into it. I am sure it helps many people. Keep up the good work! I live in hope that someday people will stop giving my kid with limited finger control, weak hand strength and intentional tremors nothing but legos and puzzles or craft kids with a bazillion itty bitty pieces.